February 2016: I have created a new YouTube channel with tips and tricks such has how to get started with Addons. Version 3.12Independent Palette types for tab states. Version 3.6 Palette rewrite and paint mode. Welcome to the new home of the QuickFolders project. If your looking for the latest version you can download it at Mozilla. Make sure to visit our YouTube channel with tips and tricks such has how to get started with Addons. 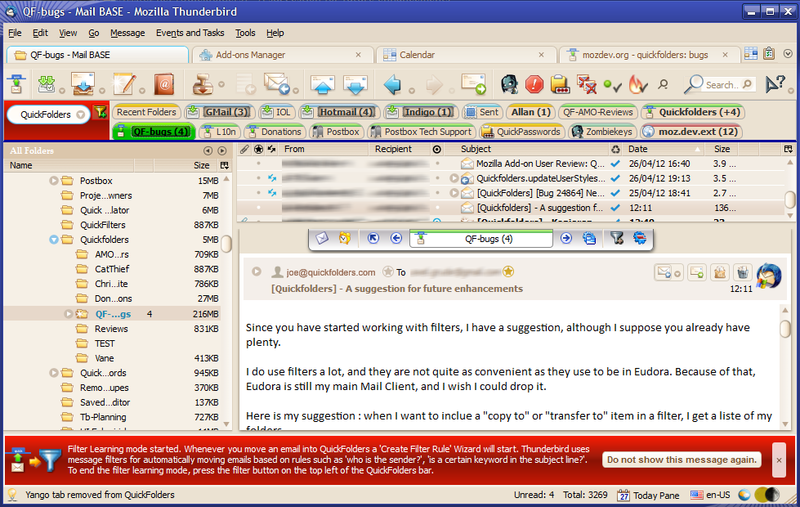 QuickFolders is a thunderbird extension created by Alexander Malfait and me (Axel Grude). Folder Tabs - cuts through the clutter of the folders sidebar by having your most important folders as tabs. Open folders and sub folders, move/copy mails without scrolling around or searching. Use categories for filtering the faves! For Getting started skip down to this section or have a look at to the screen shots section! This extension adds an extra toolbar to Thunderbird. When you drag a mail folder to it, you get a tab that acts as shortcut to that mail folder. This supports full drag and drop, like the corresponding folder in the folder tree - You can drag messages on it to move/copy them to the folder, and access the bookmarked folders through keyboard shortcuts. Next, you pull your most used folders from the folder tree pane onto the new toolbar. This will rename it in the QF tab but the folder itself will keep its old name! Vice versa, if you rename the folder itself the QF tab will NOT get a new name. You can now alternate between the folders (Studio and Inbox) quickly by clicking the corresponding tabs (Studio and GMail). Since the Inbox should be at the left hand side, I simply drag the tab to the left of the Studio folder. You have probably noticed on the previous image that a menu was shown under the tab - this happens if the folder contains subfolders. These also accept dragged emails - to achieve this drag the emails first to the tab and wait for the menu to popup; then continue to drag down to the subfolder. Once the correct subfolder is highlighted let go of the mouse key. The options 'Use keyboard shortcuts' and 'Use Ctrl instead of Alt' control the actual shortcut behavior. This can be used to quickly access the first 10 folders using [Alt]+0 .. [Alt]+9. Beware as other extensions (such as lightning) might interfere with these. Display tabs for folders with unread messages in bold: Handy for seeing unread tabs at a glance. Display buttons for folders with messages in them italic: Another option to distinguish empty and message-containing folders. Display tabs with newly arrived mail italic: Only applies to mails that has arrived in the current working session. Highlight folders with new: Only applies to mails that has arrived in the current working session - displays a yellow "diamond" and a shadowed inset field to emphasize new mail. Also works in subfolder menus - highly recommended. Display the number of unread messages on the folder button: This is updated while you read emails and receive new mail. The number is shown in brackets after the folder name, like this: Inbox (10). If no unread mails exist in the folder, the number is not shown. Display the total number of messages on the folder button: Similar to the option "display number of unread messages". If both options are on then unread count is listed first, like this (1 / 100). If no unread emails exist, then the first number is omitted. Also display totals of sub folders: If this option is activated, all totals contained in subfolders are displayed as additional number preceded by a +, using the preferences above (display unread / totals). It also will result in the tab being bold if subfolders have unread mails (and the bold option is active). Highly recommended. Focus on Message List when changing tabs: When you click on a tab you can now start navigating the folder list with the cursor keys straight away. Expand Subfolders in popup menus: When you click or drag mail to a tab it will show all subfolders, not just the ones contained in the first level. Force alphabetic Sorting of menus with subfolders: I tried to sort the folders in a more logical way attempting to include the most commonly used special characters of various languages. Some room for improvement here. Hide QuickFolders when they are not needed. This applies mainly to content / search / calendar tabs and will hide the QF toolbar on these. quickMove button: use this button to move emails to any other folder quickly. drag on your mailsand start typing a folder name. For advanced configuration of this feature and a keyboard shortcut, pleasee refer to the "Pro" settings. Reading List: use this button to bookmark emails permanently. Click on the email title to jump to it or use SHIFT or CTRL to open the mail in a new tab / window. 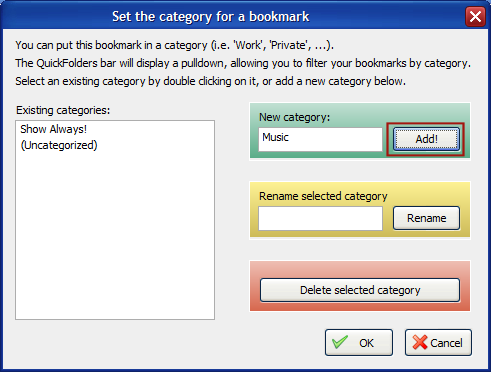 The number of bookmarks is limited in the Free version of QuickFolders. Current Folder Toolbar: the little toolbar above the preview message area can be configured here. 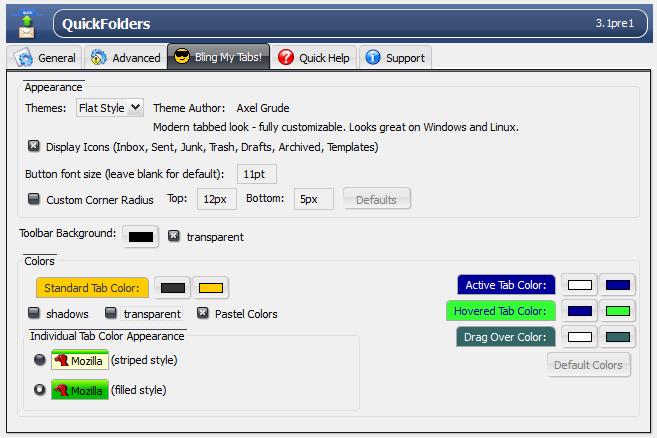 Menu Configuration: Hides / shows the most common top commands on the tab context menus. Miscellaneous: You can make the 'Quickfolders' label at the start of the QuickFolders toolbar invisible in order to save space - new (in 1.9): change the actual text by right clicking this option. Debug: this enabled on messages that can be used to troubleshoot problems. These show up in Tools / Error Console. Additionally, more verbose messages can be toggled on/off by right clicking the debug option. The delay is a waiting time (in milliseconds) that delays the visual initialization procedure of QuickFolders which can be used in some cases when the styling doesn't work after starting Thunderbird. Normally you shouldn't need to change this. Now we can see a new dropdown control on the QuickFolder bar, which is currently selecting (Display All). You can change to select 'Music' and only see the Studio folder. instead, lets add the other 2 folders (M-Audio and SoundOnSound), right click on M-Audio, and select 'Set Tab Category...' You can now see 3 selections: Music, Show Always, and Uncategorized. Select the Music entry and click OK.
Mail Folder Commands are a sub set of the most useful commands from the folder tree (left hand side of Thunderbird). 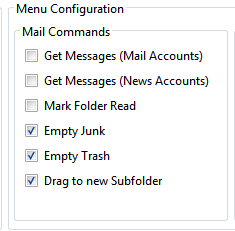 Anything you do here will directly affect your folders I often want to use such mundane commands as "Mark all Messages Read" or "Empty Trash" without having to reach over to the folder tree... if there are any important ones I have missed, please head over to the bugs section for requests. There is also a dedicated button for mail commands on the current Folder bar. 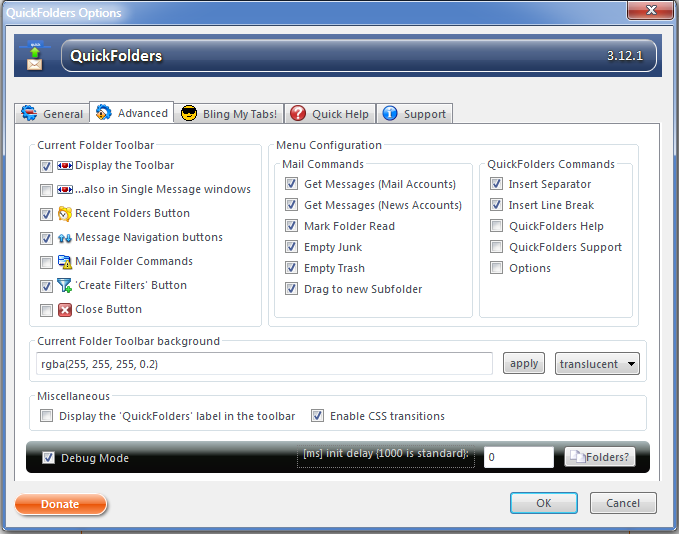 QuickFolders Commands are special commands that change the structure or display of the QuickFolders - as such they do not affect your Emails or Mail Folders directly. As a shortcut, you can hold down CTRL while you right-click a tab to access this menu directly. With the same right-click menu we can now also remove tabs that are not necessary by selecting 'Remove Tab' from the popup menu. 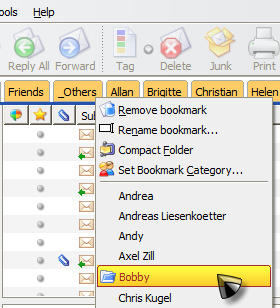 If you want to move a folder to a different position in the tree, I highly recommend dragging it from the tree to a new location on one of the folder tabs (or subfolders) on the QuickFolders toolbar; this will ensure that the connection between QuickFolder and the Folder remains intact, in case it alread has its own QF tab. This is currently a "Windows only" feature. Hopefully there will be a version for Mac / Linux soon. 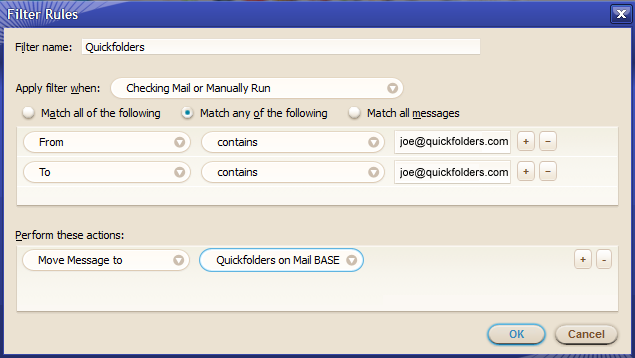 The "Filter Wizard" is a helpful utility to create maile filters in order to move mail to other folders quickly. 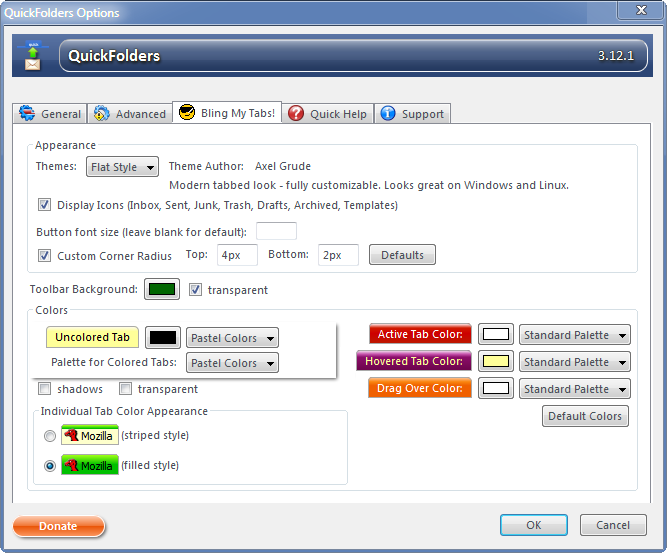 It started as a concept for QuickFolders but quickly grew into the more feature complete Addon quickFilters. I highly recommend installing this alongside QuickFolders for full filter support. Among other things, it prefills the destination folder for you after you have dragged the email into one of the QuickFolders (or children). 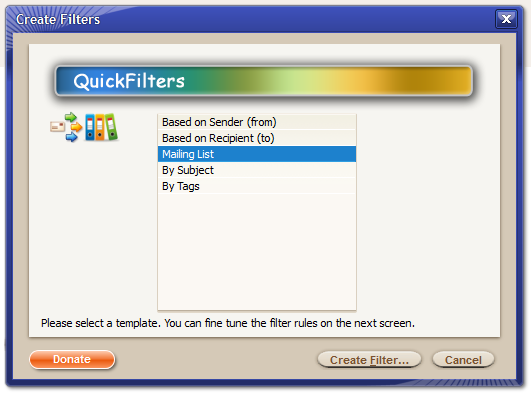 quickFilters (and the filter wizard) are absolutely the quickest way to generate powerful filters with a few clicks. 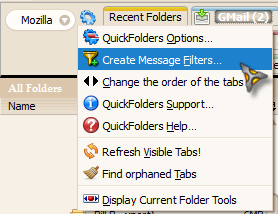 You can start creating filters by either clicking the filter button on the current Folder bar or by selecting the "Create Message Filters..." command from the QuickFolders options menu. To end this mode, simply click filter button again. 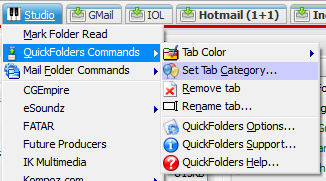 Drag an email to the top (either on a quickfolder or into a subfolder menu on QuickFolders). This will trigger the Create Filter Wizard. Since in this case I chose "Based on Sender", it will pull all conversations from and to joe@quickFolders.com into the QuickFolders folder. 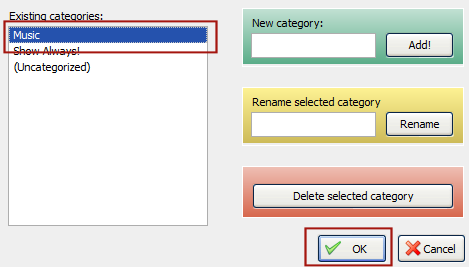 No need to select the folder (as it has been done automatically) or to enter any condition (this is based on the template that you have chosen). When you're done, click the filter button again to disable "Filter Wizard" mode. With this, it is very easy to create new filters very quickly. 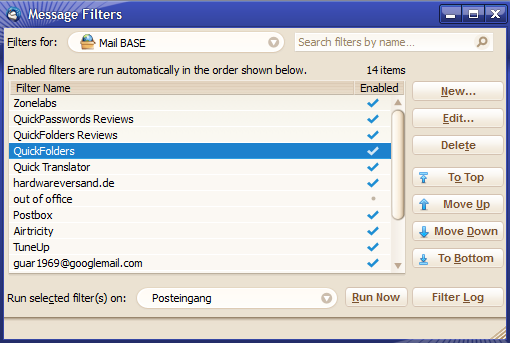 The additional functions that I added to the filter list dialog I actually programmed after I had created the possibility to create many filters (as the list became too long to handle without the search function). Do expect more functionality around filters in the future, but I am also very interested in your feedback on the function I have described above. I have been planning to add the Current Folder (Tool)bar for a while and it took more than a year of gestating this idea and around 3 weeks to implement. I noticed that despite best efforts I would still reach over to the folder tree for such mundane tasks as removing junk mail or flagging all mails of the current folder as "read"; usually this would be because the current folder was not actually a quickfolders tab or I couldn't actually see it as I wouldn't bother looking "up there", so I thought to myself 'having all these commands at my fingertips for the current folder, while I am reading my mail, now that would be helpful...' So I came up with the "Current Folder Tab", which is "like a quickfolder" but always representing the folder currently viewed. left, for the previous mail folder, the tab itself (which automatically pops up all subfolders when you click on it), right for the next mail folder, and you can probably guess what the up button is for: that's right the current parent. One speciality is that you can actually drag the current folder tab around like a folder itself and put it on the QuickFolders toolbar as a new tab. The look of QuickFolders is selectable via the "Themes" drop down in QuickFolders options / Layout. Display Icons: There are some special folders which can be found more easily if they are marked with an Icon. Display tabs as Flat Style: The Flat style makes the toolbar buttons look like Tabs (I use this style on all my screen shots). Button style was the default when Alex created the plugin, and you might find that it suits better to the look of your current Operating System. Please note that quite a few visual options, such as the Drag Indicators are not available when Flat Style is disabled. Most of the color options also only work with Flat Style. For the different tab states you have 2 colors to choose, one for the text (left color field) and one for the background (right color field). The colors are currently picked with the standard color picker so the selection is limited - future versions of QuickFolders will probably have more freedom in selecting other colors. The actual appearance is either fully colored, or, more subtle, as a colored stripe at the top (this was my original design). You can select this on the Options Page "Bling my Tabs!" 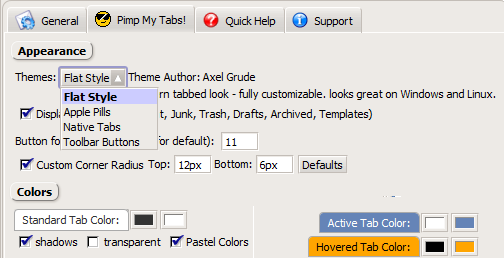 under Individual Tab Color Appearance.